TransCanada’s claim that the southern route of the Keystone XL Pipeline is the safest pipeline ever built in the in the United States is challenged by the release of new documentation confirming multiple code violations. Mounting evidence that the pipeline was not built to mandated minimum requirements established by the American Petroleum Institute increases the chances the pipeline will leak or experience a catastrophic spill. The reports — prepared by federal regulators with the Pipeline and Hazardous Materials Safety Administration (PHMSA) — reveal some code violations not previously disclosed. The number of reports also account for less than half the number of days the agency claims it spent inspecting the pipeline while it was being constructed. Last year President Obama denied TransCanada a permit to build the northern route of the Keystone XL pipeline across the U.S.-Canada border. But his administration had fast-tracked the construction of the southern leg of the project in 2012. The Keystone XL’s southern route, renamed the Keystone Gulf Coast Pipeline when the project was split into sections, goes from Cushing, Oklahoma to the Gulf Coast. In Cushing, the pipeline connects to TransCanada’s pipeline network that originates in Alberta, Canada. After mandatory safety tests revealed potential problems with the integrity of the southern pipeline, TransCanada dug up 130 sites and made repairs before the pipeline was permitted to start up. PHMSA noted in its final inspection report that 37 sections of pipe had to be cut out and replaced and many areas of the pipeline’s coating had to be repaired. The Tar Sands Blockade, Public Citizen, and landowners living along the pipelines path monitored the repair work. They were joined by Evan Vokes, former TransCanada materials engineer-turned-whistleblower, who shared his technical expertise. They requested PHMSA require TransCanada do a new pressure test on the pipeline to test the integrity of the repairs. But PHMSA turned them down at a private meeting held shortly before TransCanada started up the pipeline. PHSMA explained that it had faith the repairs were done correctly and assured the group that its inspectors spent over 150 days inspecting the pipeline during construction — overseeing welding, coating, installation, backfilling, testing and all other construction activities. That claim prompted Kathy Redman, a member of the Tar Sands Blockade, to file a request under the Freedom of Information Act (FOIA) for the daily inspection reports. In total 66 reports were released covering 70 days. Of those reports, two recount a PHMSA inspector aborting his mission after being warned that protesters would be at the site he planned to inspect. Another recounts an inspector sitting in on a safety training session with contractors and interviewing personnel. Vokes believes it would have been prudent for regulators to spend as much time as possible monitoring the construction of the pipeline. TransCanada has been cited on more than one occasion by regulators in the U.S. and Canada for not complying with construction code. A couple of the company’s latest projects blew up, not long after they started operating, including the Bison Pipeline in Wyoming and the North Central Corridor Loop in Alberta, Canada. DeSmog asked PHMSA if it had documentation to prove more than 150 days were devoted to inspections. “The discrepancy in the number of days the agency claims it spent inspecting to the number of daily inspection reports makes me doubt PHMSA’s credibility,” Redman told DeSmog. The reports she did get added to her concern that the pipeline is a disaster waiting to happen. The reports include inspectors’ observations of TransCanada violating construction codes. A report dated 10/30/2012 describes a welder who had the wrong welding rods in his bucket. A welding inspector is required at all construction sites during pipeline installation. Using the wrong welding rods leads to bad welds, and bad welds can lead to slow leaks. “The welder and the welding inspector should have been fired on the spot,” Vokes said. Vokes found it troubling that the inspection report makes no mention of PHMSA’s inspector taking immediate corrective action. He believes stopping construction after discovering the wrong rods in a welder’s bucket would have been an appropriate response. In another PHMSA inspection report, dated 7/09/2013, TransCanada’s pipeline coating problems are noted. At a dig site where the company was assessing issues detected by a safety test, the inspector found damage done to the coating caused by a shovel. Previously released warning letters PHMSA sent to TransCanada reprimand the company for hiring unqualified welders and not protecting the pipeline’s coating during installation. And PHMSA’s final inspection report reveals TransCanada received unsatisfactory marks on welding procedures and installation practices related to the pipeline’s protective coating. PHMSA did not fine TransCanada for any of the violations it cited in warning letters or require a second pressure test after TransCanada repaired the pipeline, although it has the regulatory power to do so. Because pipeline regulators in the U.S. and Canada are not using the full force of their regulatory power, Vokes points out, operators have little reason to change their ways. Redman is skeptical she was provided all of the documents she requested. Regardless, the 66 reports she was able to obtain confirm her belief PHSMA didn’t spend an adequate amount of time acting as a watchdog of a company with a questionable safely record. “Anyone who relies on a safe water supply along the pipelines route should be concerned,” she said. We cannot let up until Keystone North is vanquished, but all signs continue to point to the president nixing TransCanada’s cross-border permit. The latest flashing sign is a White House promise to veto a Keystone pipeline bill just passed by Congress. He also said “no challenge – no challenge – poses a greater threat to future generations than climate change.” For a president so clearly concerned about his climate legacy, he knows that approving Keystone North would destroy it. There’s just one little problem. He already approved Keystone South. Please let that sink in for a minute. The map above shows why Keystone South (the solid teal line at the bottom, completed in 2014) was an even bigger play for Big Oil than Keystone North (the dotted red line at the top). 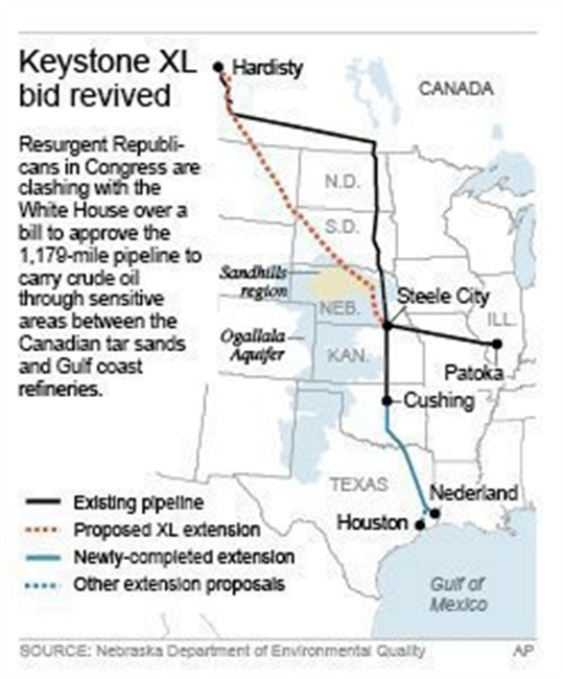 Linking Keystone South to Keystone 1 (the black line, built in 2010), gave TransCanada what they wanted most: a straight shot from the minefields of “Mordor” to refineries on the Gulf Coast. With 70 percent of the capacity of Keystone North, Keystone South has the ability – even without Keystone North – to transport more than half a million barrels of toxic tar sludge daily from Canada to Texas. In June of 2013, the president said, “Our national interest will be served only if this project does not significantly exacerbate the problem of carbon pollution.” Last week, the president’s own EPA informed him the pipeline would indeed cause a “significant increase in greenhouse gas emissions.” The climate test President Obama set for Keystone applies equally to Keystone North and Keystone South. • TransCanada’s built-to-spill Keystone South now lies buried in the backyards of pipeline fighters like David Daniel, Julia Trigg Crawford, Michael Bishop and Eleanor Fairchild, where a recent plague of earthquakes in Texas and Oklahoma could release its black venom into waterways and the Carrizo-Wilcox Aquifer at any time. • Keystone South is perpetuating scorched earth extraction of tar sludge in Canada, where First Nations and the Métis are suffering what has been termed a “slow industrial genocide,” with many people dying from cancer caused by industrial heavy metal contamination of traditional foods. • Keystone South was ruthlessly rammed through tribal and ancestral lands in Oklahoma without adequate consultation to protect sacred sites and other tribal interests. • Keystone South’s toxic cargo will be processed in petrochemical refineries across the fence from where children play in Port Arthur and Houston, resulting in even more poison raining down on these communities of color. It is not enough for President Obama to deny a cross-border permit for Keystone North. If he truly believes the greatest threat facing future generations is global meltdown, he must put forth a real climate action plan that includes shutting down Keystone South and all tar sludge pipelines crossing our border, and preventing the industry from establishing a beachhead in Utah’s red rocks country. As the editor of BuzzFlash at Truthout reminded everyone in 2013: “When Obama approved what is known as the southern leg of the pipeline, the spigot was opened to transport the climate-killing tar sands oil to refineries and ports in Texas.” That spigot must now be closed. Fortunately, President Obama is a smart and accomplished man. What he could figure out how to start, he can figure out how to stop. Benjamin and Shannon blockading an excavator in Wood County, Texas. On Septmeber 25, 2012 Benjamin and Shannon locked themselves to Keystone XL construction machinery outside Winnsboro, Texas and delayed pipeline construction for most of the day. Police began using aggressive pain compliance tactics when a senior TransCanada supervisor arrived and actively encouraged it. Torture tactics included sustained chokeholds, violent arm-twisting, pepper spray, and multiple uses of tasers, all while blockaders were in handcuffs. Immediately following a consultation with TransCanada supervisors, law enforcement handcuffed the protesters’ free hands to the excavator in a position behind their backs in stress positions, and then subjected them to repeated torture tactics. Four police officers participated while TransCanada employees stood by and watched. “Pain compliance” should never be used on anyone! “Pain Compliance” is another term for torture. Even at face value, it means “we’re going to hurt you until you do what we say.” This is not how civilized people behave, as anyone who attended Kindergarden should be able to tell you. Second, the police officers in Wood County did not escalate the violence until the agents of Transcanada, a large Canadian corporation, arrived on the scene. Our police officers should not be taking marching orders from corporate middlemen who have no accountability to the general public. Third, tasers are tools for immobilizing someone who poses an immediate threat – not tools for “pain compliance” to convince protesters to stop protesting. Same can be said for pepper spray. When I remember what happened, I remember the beauty first. The blue sky, the soaring hawk, the oak sapling mangled by the backhoe we’d stopped. That oak was very inspirational to us as we awaited our fate. By surviving TransCanada’s clear-cutting, it symbolized our own plans to weather the forces marshalled against us. It was Tuesday, September the 25th. I was anchored to the back of heavy machinery with someone I’d just met. We’d both travelled to East Texas to help derail TransCanada’s massive tar sands pipeline. Climate change is a global problem, but this terribly destructive project was coming right to our backyard; how could I sit idly by? For years now, TransCanada has been abusing eminent domain to expropriate Texans’ land for their phenomenally wasteful pipeline. Years of political lobbying had led to project delays, but had been insufficient to stop TransCanada from breaking ground. Despite multiple lawsuits, TransCanada was busy clear-cutting forests on disputed land, and so I joined TarSandsBlockade.org — a nonviolent direct action campaign dedicate to stopping the KXL Pipeline. I joined the Tar Sands Blockade for three reasons. One: We hoped to prevent the tar sands carbon bomb from being released, with the goal of preventing catastrophic levels of climate change. Two: As a proud member of Occupy Houston, I felt I had a responsibility to help prevent a multinational company from perverting Texas law so it might misuse eminent domain for its own private gain. Three: A belief, rooted in my Unitarian Universalism, that I have a duty to assist nonviolent tactics and help demonstrate that they are a successful path to change. Things began calmly enough. Around 10 a.m., a small group of us discovered a backhoe that was working on a path perhaps a thousand feet away from – and rapidly approaching – the trees containing our friends’ aerial blockade. We had a chance to delay the threat; we took it. At a run, we approached the machine. The driver stopped promptly, and Rain and I attached ourselves to the hydraulic arm at the back with a “lockbox” — in this case, a steel pipe modified so that we could latch via carabiners onto a center pin. Rain and I had known each other for less than a day, but now I can’t imagine enduring what happened without her. TransCanada’s workers were upset when we locked ourselves onto their machine, but the situation remained verbal and stayed peaceful, if tense, for hours, until around two o’clock in the afternoon. Even after the arrival of the local police, we knew we were still in civilization; one of the TransCanada workers brought us water so quickly and quietly that the officers watching us didn’t even notice. When things changed, they changed suddenly and with startling brutality. It started with the arrival of TransCanada’s senior supervisor. The regular employees became scarce as the supervisor called for a huddle with the police. The huddle broke and a phalanx of officers marched on us to announce that we were under arrest. Failing to unlock immediately was resisting, which would result in additional charges and justify the officers’ use of “pain compliance.” I suppose TransCanada had grown tired of waiting. They started like schoolyard bullies – taunting us while twisting my arm behind me, and jumping on my back to put me in a choke hold. I didn’t say it because I was sure they would misinterpret it as blasphemously casting myself as Jesus, but I meant it; I wished there was another way to accomplish our goals. I wasn’t looking forward to what my time with the ACLU led me to expect they would do to us. But I don’t believe in giving in to terrorism; to follow one’s moral compass in spite of extreme challenges is the way we move forward. The lieutenant told us he understood – the state had just taken some of his land to build a freeway. I tried to explain that this was different; Transcanada was still in court to see if they even had the right to be there. Even though he admitted that he had never seen anything like this in his twenty-two years of law enforcement, I failed to get through. Before breaking out the pepper spray, the officers handcuffed my unlocked arm to the backhoe. One officer then maneuvered my right arm so the nozzle of the can of pepper spray could be inserted into the lockbox anchoring us to the machine. Pepper spray is designed to be sprayed from a distance so the aerosol can dilute the active ingredients with air. Surprisingly, it didn’t hurt badly at first, and I thought, “Oh, this is like peppers that gradually build up in intensity.” Then they repeated the spray on Rain’s side and I could feel it entering the cuts on my fingers. It was through a single finger each that Rain and I were linked to each other. The pepper spray made our fingers slippery, and Rain’s fingers were already numb from how our arms were twisted. But compassion only needs a tiny connection to be more powerful than despair. In a moment of dark humor, we discovered that we knew to hold our breath when the pepper spray was being dispersed, but the cops didn’t, so it was the aggressors who first felt the effect of it, coughing and choking. We had closed our eyes, sure that they were going to spray us in the face, but we were spared that. The cops were surprised that we didn’t immediately let go, and they tried to joke away the wait. So when one of them said, “But Lieutenant, the pepper spray is expired!” I didn’t believe them at the time. The officers showed me the canister afterwards when we were in custody; it had expired in 2000. While the burn was building, the lieutenant assured the TransCanada supervisor he would buy a whole new crate for us protesters. When the pepper spray failed to produce immediate compliance, they broke out the taser. The police’s announced plan was to taser us repeatedly for increasing intervals until we detached. The older, plainclothes cop calmly explained that he was going to say “taser” three times, then engage for one second in my leg. Each repetition would be for an increased duration. One second of intense pain takes you outside of time; nothing exists but the pain. A taser is sold as a weapon-tool for halting controlled motion: to make someone stop. While the torture device was on, I was able to remain standing and silent, but the pain was intense. I could not have gathered the concentration required to detach the carabiner even if the pipe hadn’t twisted it out of my grasp. I had a few seconds to clear my head, then he switched to my upper left arm – the arm where they had handcuffed me. It’s hard to describe. The world was pain, and I repeated Valerie’s quote from V for Vendetta to myself as I heard the lieutenant speculate to the TransCanada supervisor that my fat was insulating me, making it harder for the taser to “bite into the meat,” which is why it wasn’t hurting me as much as they were hoping. The pain was fluid, and by the fifth second, my left pectoral muscle was tingling. But like all things, it passed. The pain, like the fear, washed through. The taunting, however, continued. The officers informed us that I was too “mule-headed” to be chivalrous and spare Rain the pain I had just experienced. When they moved on to torture Rain, the young Wood County deputy who had been selected to taser her was reluctant. He asked if he really had to; he interrupted his count to ask if she was sure she wouldn’t let go. I don’t know what combination of humanity and patriarchal programing was at work, but it was a notable difference from the officer who tortured me. Rain was clearly in more pain from her treatment than I was, and she has a health condition that made sustained tasering significantly more dangerous to her. Rather than have the police continue to dice with our lives, we decided to detach. Throughout our ordeal, Rain and I were able to reassure each other by holding fingers inside our steel pipe; this human contact sustained us while we had to endure each other being tortured. It also allowed us to be sure that the decision to detach was mutual. Due to the earlier twisting of the tube and the effects of the torture, we were unable to untangle ourselves from the restraints without assistance from the cops.